Posted September 19, 2018 by Georgia Fullerton & filed under City Hub, City News, Featured City News. 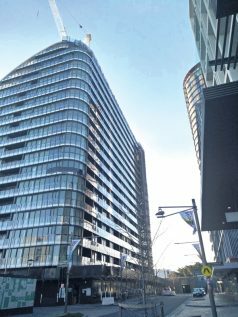 The City of Sydney is planning 330 new affordable rental units in Green Square within the next 15 to 20 years in a bid to ease mental stress. This will add to community housing group City West Housing’s contribution of 200 affordable units as part of the Green Square Town Centre development. Over the past 5 years, the median rent for dwellings in all bedroom categories in the inner west has risen, causing rental stress for people on low to moderate level incomes. Ms Walsh claimed the number of low-cost private rentals available for low-income households had reduced by more than a half from 4,410 in 2006 to 1581 in 2013. Even with the extra affordable homes in Green Square Karen Walsh said she has estimated NSW needs 8000 to 10000 more affordable housing places per annum in order to keep up with current population levels. “It’s a huge need and it’s a growing need and it’s literally growing every day and every week,” she said. Green Square resident Michelle Eckardt shares a 2 bedroom house with 2 others for $650 a week. “I like the Green Square area but the prices are ridiculous, we’re getting a good deal really for $650, most other 2 bedroom houses are $800 or more,” Ms Eckardt said. She said living through the construction of the Green Square Town Centre was inconvenient, but for the greater good. Resident Angus Cohan said he was concerned the infrastructure would not be sufficient for the increased population. 33-year-old local Urijah Sward said he welcomed the development and dismissed other residents’ concerns. “They’re worried about the quality of life, which is a joke because the worst thing for the quality of life is not having affordable housing,” he said.